BBC Gardeners’ World magazine have announced the shortlist for the People’s Choice Award 2018 – which includes a garden in Penarth, Vale of Glamorgan. Launched earlier this year, BBC Gardeners’ World magazine’s Garden of the Year competition, sponsored by Flight Centre, asked readers to nominate their private gardens to win the coveted accolade. Nearly 500 entries were whittled down to a shortlist of 11, from which Wayne Amiel’s Jamaican inspired South London garden was named the Judge’s Choice. Now, all 11 shortlisted gardens are open to the public vote for the People’s Choice Award including Gulrukh Saleem’s garden in Penarth, Vale of Glamorgan. Described as a “colour explosion” Gulrukh’s garden delighted the judges for its exuberance and sense of joy, bursting with colourful plants, plus white paintwork and palms for a Mediterranean feel. BBC Gardeners’ World editor Lucy Hall, says: “This year’s entries to our Gardens of the Year competition prove that we’re not only a nation of passionate growers, but we’re also truly global in seeking inspiration for our gardens. Escapism was the clear design trend that leapt out for judges, from the largest plot to the tiniest courtyard – a creative response, without doubt, to the pressures we all feel today from city living and our always-on society. Richard Small’s Tyne and Wear courtyard, the tiniest garden in the final at just 3.2m x 6.6m. The judges were impressed with the focus on only green and white plants, along with fitting so much into a small space. Carefully incorporated recycled materials gave Benn Storey’s 21m x 8m inner London garden real standout. It’s just two years old, which impressed the judging panel, with plenty of places to sit and relax. A boring back garden laid to lawn has been transformed into a Sussex jungle hideaway. Tim Richardson and his partner have worked tirelessly over the past 19 years, doing all of the work themselves. At 1.5 acres, Robert Bailey-Scott’s Lincolnshire garden was described as an ‘amazing achievement’ by the judging panel, as he and his wife have no regular gardening help. The enormous herbaceous border and the wildflower meadow were particular highlights. It was the serene courtyard of Ed Greenall’s one-acre Herefordshire garden that stopped the judging panel in their tracks. But there’s more to the space, including tropical borders, koi carp pond and a potager. Plus the resident cat of course. Creating a garden for a growing family isn’t easy – especially on a roof. Karen Myrup Birchall has managed it though, and her 11m x 3m London roof terrace in the heart of the city shows how it’s possible to garden anywhere, while giving kids a safe and green play space. A north-facing site full of builders’ rubble is what Wayne Amiel faced when he moved into his south London home. Over eight years, he’s managed to create a slice of Jamaica, on a shoe-string budget. John Tordoff’s garden in Cambridge transports you to the courtyards of Spain and Morocco. What was once a derelict yard now features a theatrical, home-made arch which transforms the space, hiding the bins and shed. Combined with the tiled floor, they form a dramatic backdrop to the colourful planting. Susan Mill’s ‘S for Sue’ shaped lawn caught the judge’s attention, beautifully holding the structure of her half-acre, Bristol back garden. Thoughtful planting and a clear vision for the garden’s evolution impressed. Jacky King from Bristol has a pretty back garden, but it’s her 4m x 4m front garden that delighted our judges. Her passion for gardening is often rewarded with compliments from appreciative passers-by, bowled over by the romance of her urban cottage garden! Voting closes at midday on 1 November, see pictures of all 11 gardens, and vote for the People’s Choice Award at: www.gardenersworld.com/garden-competition. The Judges’ Choice Award was awarded by BBC Gardeners’ World magazine columnist Alan Titchmarsh, award winning gardener and designer Diarmuid Gavin, four-time Chelsea gold-medal winning designer, Kate Gould, and BBC Gardeners’ World magazine editor, Lucy Hall. 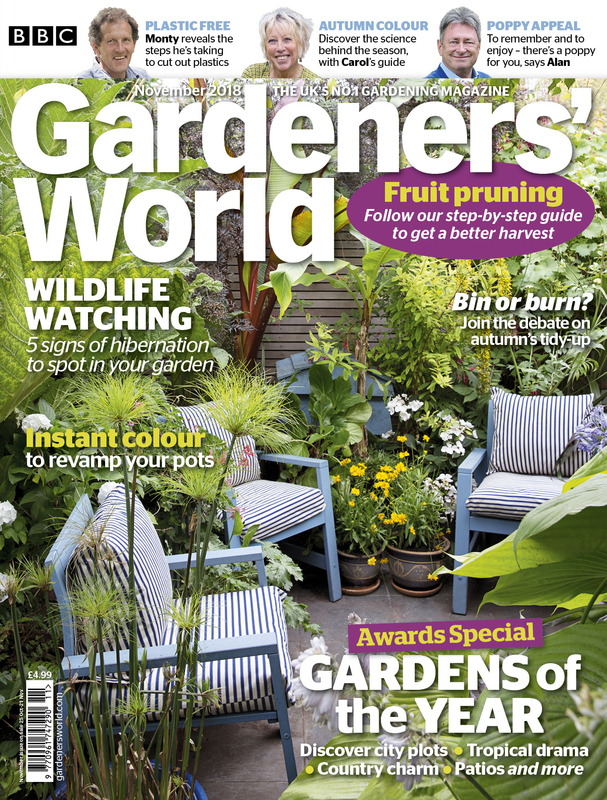 All 11 gardens are featured in the November issue of BBC Gardeners’ World magazine on-sale now priced £4.99.